Sony PlayStation 4 might be doing great, but we can’t say the same for the Xperia lineup which has become somewhat of a run-of-the-mill job. With First Flight Sony will be able to achieve to major things free of charge – learn the interest towards certain product ahead of re;ease and cut its losses in case of poor market reception for a given product. The First Flight platform will be the place, where Sony will list its inventions and people will be able to fund them. 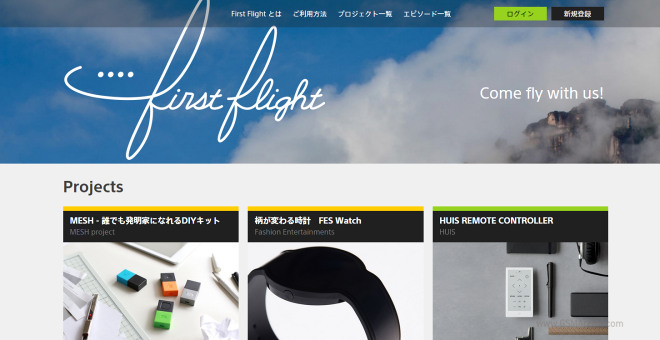 No one but Sony will be using First Flight, which makes it more like an online Sony Store for taking pre-orders. Recently Sony helped fund a PS4/PC video game on Kickstarter and it worked like a charm. Though this is still quite a gray area on Kickstarter many devs are using the platform for similar cases. The First Flight will be extremely powerful tool for Sony – the company will be able to determine with precision if a product would become a hit or not, and thus it could scrap a project way before the production stage. In case a project is funded, Sony won’t need to pay for the first batch of units from its pockets, as those will be fully paid by the backers and thus it can be protected in case of market failure later. Sony’s First Flight launches in Japan and for now will be exclusive to that market. You can try the website, but it’s in Japanese. Hopefully this helps Sony push some innovative tech on the market, which otherwise the company wouldn’t risk outing.